NYU Casa Italiana Zerilli-Marimò is the place in New York where one can soak himself in Italian culture. What is truly remarkable about this institution is the stellar variety of topics and events hosted: from exhibitions on Gabriele d'Annunzio to conversations on Italian opera, the Casa strives to give a bird's eye view of the nearly boundless Italian intellectual panorama. True to this spirit, the latest event winked at the figurative arts: it is an exhibition of works of abstract painter Antonio Sanfilippo. 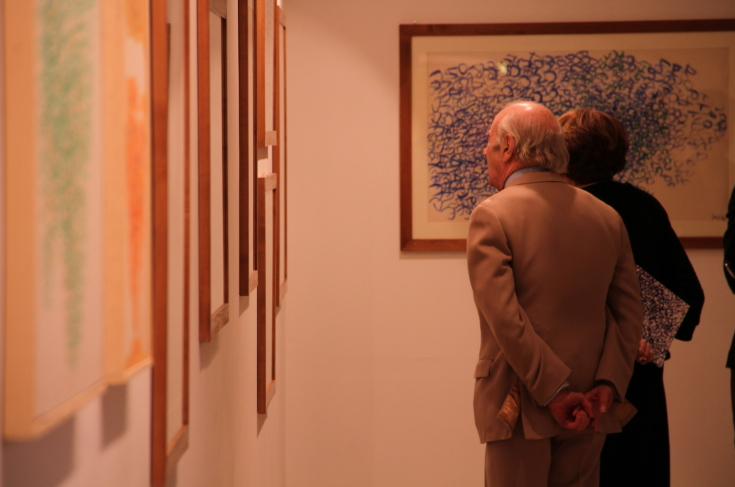 The opening of the exhibit took place on March 28, and the exhibit will be on show until May 5. At the opening were present curator Isabella del Frate Rayburn and Prof. Giuseppe Appella, author of the preface of the catalogue. During the opening remarks they gave us an idea of the concepts behind Sanfilippo's work and an overview of the artist's history, pivotal for understanding his art. The artist was originally part of the group Forma1, among whose ranks we can find other prominent Italian artists of the time such as Piero Dorazio, Giulio Turcato, Mino Guerini and Carla Accardi (wife of Sanfilippo to whom an exhibit was dedicated at Casa Italiana a few years ago). This group, made up of Sicilian artists, had as artistic cornerstone the “shape” (forma, in Italian); they said: “when drawing a lemon, we don't care much about the lemon itself, we care about the shape of the lemon”. Although a group of painters from Italy, they were highly receptive to European suggestions and trends. They actually moved to Paris in 1947, where they had the opportunity to broaden their cultural horizon through the interaction with the international artistic community. After the French experience, each of the members of Forma1, once back in Italy, gradually drifted toward different styles. Sanfilippo was struck by the works of Gorky and Pollock, seen at two different exhibits in 1957 and 1958. Since then the “shape” began to lose importance in the works of the artist in favor of the mark, the sign: il segno. 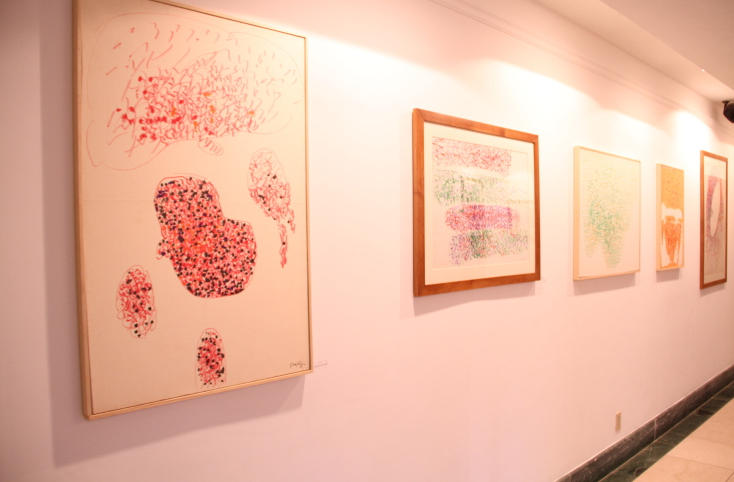 The works exposed at Casa Italiana perfectly show the appeal of the 'sign' to the artist. Sanfilippo's paintings are organic compositions based on doodles that fuse together on the canvas. The tangle of marks that is represented in the paintings is a true figurative oxymoron: somehow a unification of vacuum and matter, organized composition and total chaos, presence and absence. Another important contribution to the development of Sanfilippo's style came from his native Sicily. Like the Alps, with their constant rockslides and erosion, are at the base of Giacometti's statues, carved and eroded much like his mountains, the Sicilian landscape is a fundamental inspiration for Sanfilippo, Appella explained. Sicily is often an extremely barren land with solitary trees, hidden beehives, lonely stacks of dried branches that mark the landscape like signs. When asked why Sanfilippo still hasn't received the international attention reserved to other Italian artists of his time, Appella explained that he was a very shy, reserved and melancholic man. This was definitely not helpful when the time came to market his works. Furthermore, he died in 1980, at the beginning of a period that would have been perfect to publicize Sanfilippo's art, and he was not famous enough for his death to be a boost to his career, as sadly and often happens in the world of art.